The routine described here is used by permission of Eden Age Concern. It comes from their Golden Jubilee collection of farm reminiscences, "Life on an Eden Valley Farm" compiled by Kate Harper; see the Thanks page for details. The book is written from the point of view of a child growing up in the 1920s. Monday is washing day. It's an all day affair. ... Endless journeys to the pump to get water to fill the dolly tub and the set-pot in the wash house. 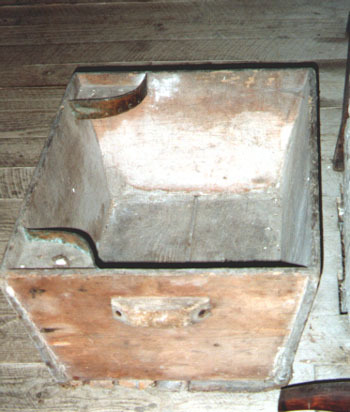 The whites (sheets and underwear) are washed in Rinso in the dolly tub, using a poss stick and dolly legs, and the collars are scrubbed with hard soap on the scrubbing board. (see Washday). Dinner is always cold on Monday - the remains of the Sunday roast - as there's no time to cook. Tuesday is ironing day, unless it's a hot summer and everything has dried in one day. The main tool is a box iron ... two heart shaped pieces of metal, one of which gets heated in the fire, while the other is in use in the iron. 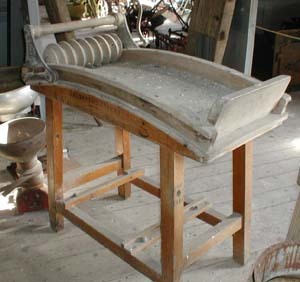 Tuesday is also churning day, and market day in Penrith. ... "Butter churns best when it's cold; it does fine when it's hot, but it takes forever when it's humid" .... What the family gets for the butter and the eggs generally pays for the rest of the groceries. Wednesday is the day for cleaning the bedrooms, stairs and landings. Floors are swept, sheets changed, everything is dusted and the mats shaken. The women use goose-wing dusters (the long-feathered, bony, almost fleshless wingtips off geese) to get the cobwebs down and for cleaning the bed-springs. Finally they clean the upstairs windows and sweep the yards. Thursday is baking day. The fire has to be stoked high as bread and cakes require a hot oven. 18 to 20 white or brown loaves each baking day, pasties, plate cakes, scones, ginger cake, parkin, rock buns, tea cakes, squares. Dark fruit cakes are usually only made for Christmas and birthdays. Christmas cakes and puddings are made in August to mature. Friday is clean-up day before the weekend. All the brass, cutlery, and the downstairs windows are cleaned. The flags are scrubbed on hands and knees. The women have to rudd the step, blacklead the grate, emery board the fender and shake the mats. Friday night is the time for a dose of treacle and brimstone (sulphur) for the children - supposed to "keep them regular!" Friday night or Saturday night could be bath night - the tin bath filled with hot water in front of the kitchen fire: girls first, then boys, Mam and Dad last. The water isn't changed but topped up with more kettlefuls of hot water. Saturday - the children are free of school and can help with chores - all the odd jobs are done on Saturday, mending clothes, darning, sewing on buttons; as well as the daily jobs that they do, such as cleaning the glass chimneys on the oil lamps and filling the bases with paraffin oil; feeding the hens, collecting the eggs, chopping the kindling, bringing in coal, blackleading the range, polishing the fender. They get eggs and bacon for breakfast on a Saturday, and maybe sausages too; during the week it's "proper oatmeal porridge" that needs to be steeped overnight before cooking; sometimes during the week breakfast is just bread with beef dripping or bread with jam. Sunday is a day of rest. The family dresses in Sunday best clothes and goes to church. If it's distant, they go by pony and cart, but if the family walks to church then they wear rubber goloshes over their shoes, to save muddying good leather. Goloshes are murder to pull on over the shoes as they have to fit tightly. Sunday dinner is a roast of beef, lamb or pork, with a steamed or rice pudding after. Children go to Sunday school in the afternoon and maybe to chapel in the evening. No work is done, no knitting or sewing, and certainly nothing frivolous. In the Kirkby Stephen area a Methodist farmer may still avow that he will not even bring in a bale of hay to save it from the rain on a Sunday.... but he probably expects his wife to provide him with dinner.